There was much excitement on the afternoon of the 4th July 1887 as the people of the town celebrated the Dedication of Queens Park, in conjunction with Queen Victoria's Jubilee and the local Jubilee of the opening of the Grand Junction Railway 50 years ago. Visualise and imagine the atmosphere created that day. A large number of Venetian masts, streamers and flags were placed along Victoria Avenue and all around the park and town. Banners with "Best Wishes"messages were hung from buildings and an array of other carefully constructed decorations could be seen. "Fireman's Arch". This was formed, by the Crewe Volunteer Fire Brigade, at the entrance to Victoria Avenue The arch was constructed from fire escape ladders, decorated with bunting, shields, mottos and the Town Council's Coat of Arms. Six men manned each fire escape under which the procession passed, on its way to the park. A year later, on Saturday 9th June 1888, the Park was officially opened to the public by HRH The Duke of Cambridge KG who, at the time, was the Field Marshal Commander-in-Chief for the Cheshire Volunteers and was presented with a suitable gold key. LNWR Its total 45 acres is oval in shape, with a principal axis. An 1882 map shows the site of the park lo be spread over 11 fields and part of the sewerage works, which were closed in 1874. 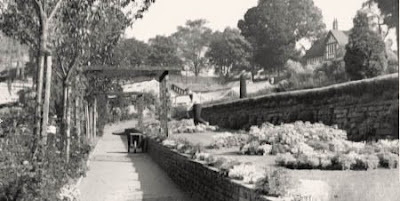 The straggling Valley Brook passes through the park and leaves the site on the south west corner A straight footpath crossed the site and connected West Street, with the park, via Coppenhall Hayes, as Victoria Avenue had not yet been constructed. duties commenced from 1935 to 1960. He was responsible for the laying out of the neighboring King George V Playing fields and the Coronation Walk, to commemorate the Coronation of George VI and Queen Elizabeth in 1937. This is a landscaped walkway, through rock gardens beside a small stream, which leads from the lake and winds up to the aviary. a public park. Politics or not. we may never know. It is only certain that Sir Richard Moon's wishes, in his Dedication speech, for the park to provide pleasure and happiness to the community for generations to come, has to date been fulfilled. A notable feature is the four and a half acre. man-made lake, which has been beautifully landscaped into the park. Its source is the Valley Brook, which runs out of view under the lake, until it reappears on the adjacent golf course. It was originally formed by "grading in" from existing banks and leveling off to a depth of five feet. By "puddling" the clay bottom it was made watertight and a dam at the west side was erected. Four bridges, originally wooden, and surrounding paths make a popular walking circuit around the lake. After the cultivating of Valley Brook, which improved the quality of the water, swimming was permitted. By the west island the water area was deepened to ten feet and a diving board and changing huts were provided but eventually removed in 1936. In 1913 a wormscrew was made in Crewe Works to aid the filling of the lake and this is still very much in use today and relied upon. furnace tip, which is now the Tipkinder Park. The target butts were on the Valley Brook bank, to the south of Burma Star Island. During the last war the lake was considered a possible location aid for German aircraft bombing the factories, so in October 1940 the water was drained out and the bottom camouflaged with evergreen branches Other branches were placed over the greenhouse, however, by April the evergreens were removed and the water replaced. It now transpires that such action was taken too late, for at the end of September 1940 the Germans had taken an aerial photograph of Crewe, showing '10K0M0TIV/FABRIK" L.M.S.R" and "FLUG-MOTOIEWWERKE, ROLLS ROYCE LTD". This also shows anti-aircraft barrage balloon sites at the Old Bandstand, Queens Park Petrol Station, opposite to St Mary's Catholic Church. Leighton Park and Badger Avenue close to Ford Lane. The Ring Road around Queens Park and the band of trees inside are in addition to the lake, all very distinctive from the air. During the renowned Winter of 1963. the ice was so thick that skaters took to the lake. In the evening the area was floodlit and hot food vans were well patronised. In 1968 the island in the middle of the lake was re-levelled and landscaped with new paths and seats, and dedicated as a permanent Memorial to the Allied Forces who fought in the Burma Campaign during World War II. "When you go home tell them of in and jay for their tomorrow we gave our today"
It is interesting to note that it is said that the fossilised remains of a Tulip Tree, a Lepidodendron. dated back to the Ice Age - of the Devonian period, some 320 million years ago. is located in the path which leads from the Cafetena down to the lake. The fossilised tree was given to the Park by John Knott when he was Mayor of Crewe in 1888/9. As a contrast just along the path, beside the Coronation Walk bridge, is a twisted Willow, now at least 30 years old with its fascinating, contorted shape. During the last war. both the flowerbeds and greenhouses contributed towards community welfare, producing seedlings of various vegetables. In 1941, approximately 35,000 onions and crops consisting of l,049lbs of tomatoes and 512 cucumbers were grown, all of which were sold to 3,470 local people. 1899-1902. The bronze figure of Tommy Atkins, with rifle, bandoleer belt, pouch and water bottle, stands to attention at the top of the monument. On either side of the base, lying down, are two full-size stone lions. At the front of the monument, the magnificent bronze engine model designed by F W Webb, once stood. This is now now proudly displayed in the foyer of the Municipal Buildings. Behind the monument is the Jubilee Cafeteria, which opened on 12th June 1977, together with the new Bandstand This more modem structure replaced the original Victorian Pavilion which was burnt to the ground on the night of the 29th December, 1972. The Senior Fire Officer reported there had been a possible electricity fault. Because the water mains had been fractured by frost, firemen pumped water up from the lake and although they worked throughout the night, it was to no avail. On Sunday afternoons throughout the summer, there is a long tradition of brass bands performing in the park, this has continued to this day providing music to suit all tastes and ages. At the other end of the main drive, at the Park's entrance, stands the prominent Clock Tower 1888 which was donated by employees of the Railway company. Unveiled by James Middleton, who had the distinction of driving the first train into Crewe fifty years prior to the clock donation. The tower is topped by an elaborate support to a weather vane. At the base of the tower, on either side, there used to be two drinking fountains with brass cups on chains. Lodge commemorates the Jubilee of Queen Victoria and the 50th Anniversary of the opening of the Grand Railway Junction. You will notice a painting of a bat, moon and tree, in yellow and green -another punT this time on Sir Richard Moon Bart, Chairman of the LNWR Company. 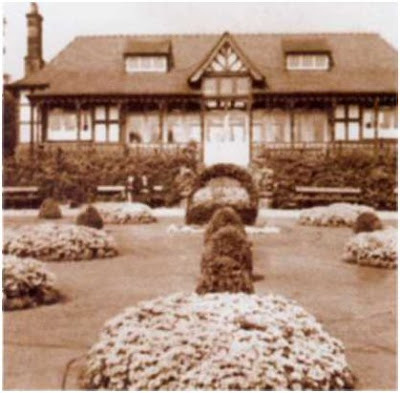 The red sandstone used for both lodges came from the railway cuttings that go down to Lime Street Station, Liverpool. These buildings are contained on the Department of the Environment's list of buildings of special architectural and historical interest Grade II. An impressive ornamental iron gateway stands at the entrance where the Lodges are located. The side gates contain the date of the Parks dedication 1887 and the main gates have a royal crown in their design supported by four red stone gateposts.